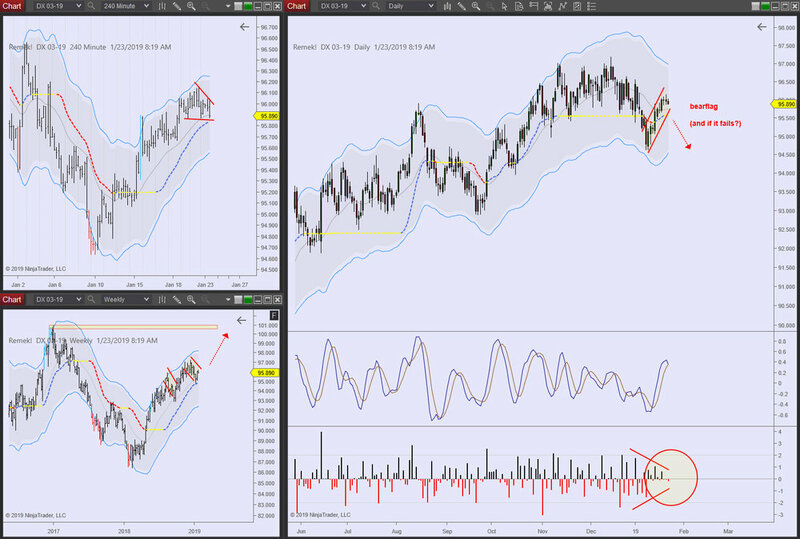 Notice the what looks like a bearflag on the DX daily, and the what looks like a bullflag on the weekly. Timeframes often conflict, this is normal market behaviour. The question is, how we can use emerging information like this, made available by the market, to our advantage. Notice that for the weekly bullflag to prevail, the daily bearflag must fail. Should the bearflag fail on the daily (the looks of which will be obvious as soon as it happens), that would be a strong argument for a bullish view on the DX for the coming weeks. (Notice the previous high on the weekly, a potential target on the weekly timeframe, as well as the volatility contraction on the daily as shown by our Relative Returns indicator).) This information, if the bullish scenario materializes, will provide important clues for trading 6B, 6E, 6A and all the other currencies, (perhaps even ZB) in the coming weeks. Bottom line: patterns fail all the time. Having a plan for them (just as we have for their success) whatever your trading timeframe, will keep your P/L smiling. Mindful trading! Trading several markets with Remek! Reading the hard right edge with Remek!